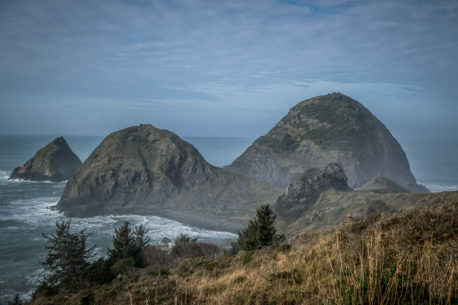 Between the Euchre Creek and Prehistoric Gardens, 13 miles north of Gold Beach, travelers are likely to see a headland with two monumental rocks connected to the mainland. A third rock, surrounded by pounding surf, stands nearby. These three monoliths are known as Sisters Rocks.